If you have read the earlier post, you know that we have been having engine troubles. But it turns out that we had other troubles I will tell you about, and we’re still not sure of the cause. I had finished my short post and went to the head to take care of business before my watch at 930am and saw that the well in the floor under the teak grate was FULL of water and there was water that had leaked out on the floor! I ran the sump pump that emptied the water in the head. I saw water around the mast in the floor, so turned on the electric bilge pump. The water started pouring out and the pump ran, and ran, and ran and didn’t stop — for a total of about 30 minutes!!! After about 5 min, Phil and I got concerned as this has never happen before. I took over the helm and managed adjusting the head sail, as we were SAILING to not run the engine and stress the water pump more. I can do this of course, but Phil usually does the micro-managing and adjusting. Phil moved the stairs and he could see water lapping towards the engine after the bilge pump ran for 10 min. Then he checked under the V-berth to check the Y valve, and no water was coming In there. Phil picked up the floor board to see how much water was in the bilge, and the white hose was covered, about 5-6″ or more, which is a lot for this boat. Phil tried to use the Manuel bilge pump, which didn’t work so that’s another item we’ll have to fix. 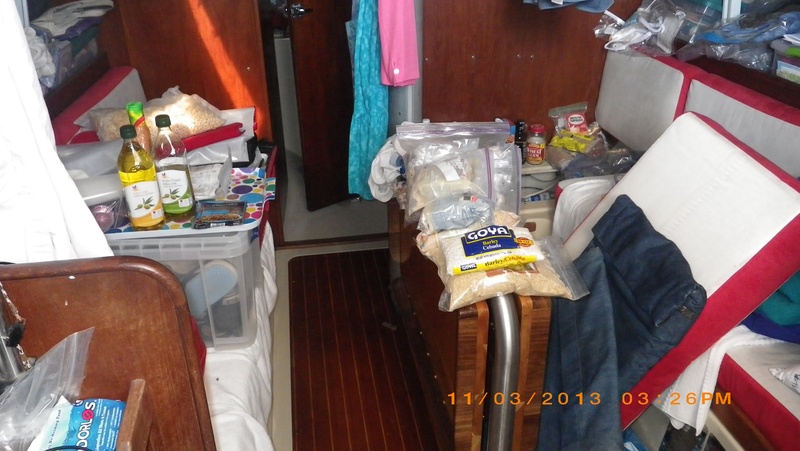 After the bilge was empty of water, then Phil took off the items on the L locker and checked inside. Being full, he had to remove the items to see the water and check the thru hull for the speedo, which was intact. Initially, Phil removed a bucket of water! During this time of emptying the L locker, we kept turning on the bilge pump several times for less than a minute to empty out more water that had accumulated. Phil also saw water in the compartment under the head sink, but that was gone after the L locker was emptied. We had been in contact with Judy of SV Bentana, who we have been buddy boating with lately and made her aware of our situation. They were about 4 miles behind us and willing to help if needed. We didn’t think we were in danger of sinking, despite everything going on and called her later with the update that the electric bilge pump was finally able to remove all the water. They will get a slip in St. Mary’s to wait out the bad weather, then we’ll meet up again. Our bad luck continued when we were not able to get a slip at Tiger Point Marina and Fernadina Beach City Marina charges $2/ft, so we decided to turn up the creek and anchor at the southern anchorage off Cumberland Island. Turning around was a little harried as Phil had difficulty rolling up the head sail even when we turned up into the wind which was in the upper teens. 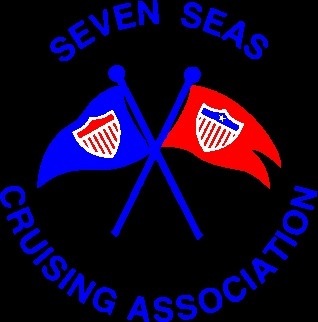 Also the current was strong, >2kts with a GPS speed 8 kts and less than 6 kts boat speed. I had to really increase the engine RPMs so that we weren’t pushed into the red mark by the current. Initially we were going 1.5 kts GPS speed, but gradually our speed increased to 3 then 5 knots as we got further into the creek. Here we should be well protected from the high winds predicted tomorrow. After the anchor set well we took stock of our situation. Phil was tired with lines of worry and fatigue on his face. I was so thankful that I had leftover soup from yesterday’s lunch so warmed that up for our lunch as neither of us had a proper breakfast having a granola bar to tide us over instead. As Phil thought about what could have caused so much water to accumulate in the bilge and check the engine compartment from inside the sail locker, I worked on drying off the contents of the L locker and thankfully I had to throw out only 1 container of baking power whose cardboard container was soft enough to bend from being wet. Contents of L locker spread out. The aluminum foil boxes were wet, but they will dry. Most of the contents were either naturally in plastic bags or I had put them in Ziploc bags so just needed to be wiped dry. Even my knitting books were dry. 🙂 Phil says they were on top. As I reloaded the now dry locker, I took advantage of the opportunity to catalog the contents on my iPad spreadsheet. Wouldn’t you know I finally use the head, and MORE water is under the grate so that was emptied. No further water has accumulated under the grate in the head or in the bilge since. Later in the afternoon the anchorage was getting bouncy. We saw three sailboats coming down the River at 330pm so decided to raise anchor to move further into the anchorage. We tried anchoring for the first time between two trawlers at 352pm. The current was coming in at about 1kt was strong enough to have us turning around and around and getting too close to MV Chateau de Mar, so we raised anchor again. Our second attempt we thought was further away, but we ended up closer than before to the trawler. By this time, I’m sure we were the afternoon’s entertainment. We raised and dropped anchor for the 3rd time, this time dragging. The Captain on MV The Susanne suggested we anchor further out. By this time 2 of the 3 boats had arrived, so we jilled until the Gemini cat had passed. 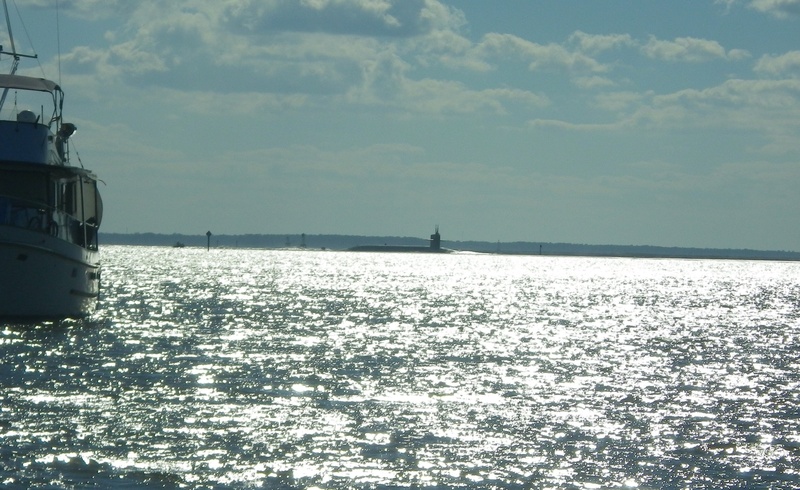 This time we anchored and ended up where we wanted and far enough away, we thought, from The Susanne. It took us over an hour to get settled. They must have thought we were not far enough away, because several minutes later they were calling over wondering if we were dragging. NO we aren’t, but the current has us one way and the wind has us on the farthest reaches on the anchor chain. We have kept our GPS on to keep track, and though our cookie crumbs make a box instead of the typical arch, we are firmly where we anchored. We had left over chicken thighs and left over potatoes with fresh broccoli and asparagus for supper. The sun set at 535pm, so it’s dark now. I guess winter is coming. Tomorrow we will see how the weather is and decided our next step. I put in a new Spot OK message for the last place we anchored and there is a track for most of our trip today. I would love to hear your thoughts on the track and ideas about how the water got in here. One good event today, we saw a Navy Submarine come up the river to Kings Bay Submarine base before we reanchored. It was far away, but were able to see with the binoculars. We were glad that we were anchored and not having to keep out of their way. There was lots of traffic on the radio from the security boats telling vessels to stay at least 500 yds away. Navy Submarine coming into Kings Bay. 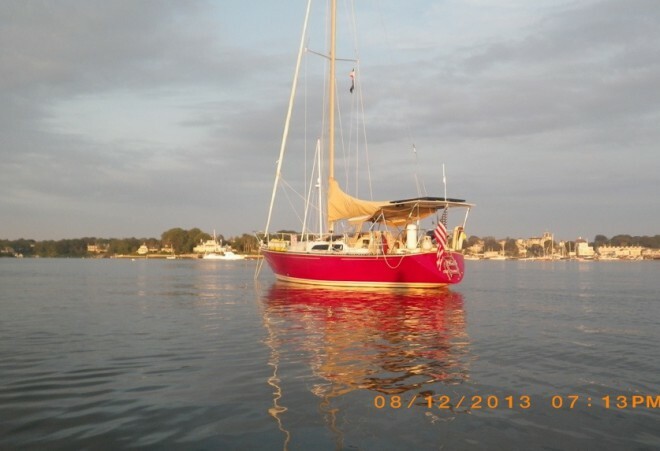 This entry was posted in 2013, anchorages, Bilge, Boat Projects, Cruising Friends, Engine, Georgia, Passages, SV Changes, United States and tagged anchorage, Boat, Cruising friends, currents, dinner, high water, Travel day. Bookmark the permalink. Lorraine, try checking the scupper hoses and where the fittings go in the haul….good luck! Phil did check them and they are dry. Thanks. Good idea! Did you ever determine where the water was coming from? Hope everything goes better tomorrow. No we haven’t. That concerns us as until we find the source, it could happen again. Oh and the water was salt water not fresh water. We check our water tank and the level was a bought right. Gosh, sounds like your day was even worse than we thought! Well, you know how it is…sometimes you enjoy the show, sometimes you ARE the show. Hope you are ok! Our dock space seems to be pretty protected. Let’s see when the wind pipes up again. Thanks for the humor. It made me laugh and how true! Glad your dock space is protected. I am sorry you are having so much trouble with the engine. Stay safe and don’t go offshore until you’re confident of the boat. Kevin’s gonna look at your past and this blog and see if he’s got any ideas. Feel free to have Phil call him if he wants to run some ideas by him. 440-478-4020 I do not know how to get your spot message, i don’t see a link. Thanks April. We don’t intend to go offshore for a few weeks. Hopefully will find the problem by then. I will make a separate page to make it easier to find. Look in upper right area. We’re so sorry for your troubles today, but glad you’re safe for the moment. Like Mom says, you have a good story to tell. Paul gets to visit them next weekend on his trip to visit his family. I hope you figure out the reason for your water trouble soon. Thanks Robin. Too bad that it’s not working out to see him too, but times is short during his visit. Take care and love you too! Was the water coming in from around the shaft? We are checking that out. At Lang’s Marina in St. Marys now so in a place that’s safe and easier to make repairs. Wow! I hope you find the cause of the leak. Just when you think you have every situation covered, there is a new challenge. Every day is different, THAT’S for sure. At least on a safe protected area. Probably renting a car to go get the new water pump. I had the exact problem on Morning View (34 #117). The bilge pump overboard discharge (for whatever reason) was tee’d into the drain for the head sink. When the check valve failed while sailing on port tack, a HUGE amount of water flooded back into the boat. It tool forever to get the water out and find where it was coming from. Once I did, I made plans to fix the check valve and move the bilge pump overboard discharge. Thanks John. Our bilge pump goes directly overboard just below our toe rail. After our hour and a half sail, we had water pumped for 55 sec. Will continue to trouble shoot. Hate the news, but glad you’re keeping us updated! Wish I had words of wisdom, but alas, nothing. Let us know when you find the culprit. Ted tried to call on the cell but couldn’t get through. We had the siphon problem with our bilge while sailing. Found lots of water coming into the bilge. Ted will try to call again later. At least you’re in a safe place. Thanks. Phil needed to manage the sails while getting over here. Thanks for the reminder somPhil could call him. Wow Lorraine. Really sounded like a harrowing time! I was on the edge of my seat. Perhaps you should write a book, I got a chuckle out of all the suspense followed by what was for dinner…lol. We can’t wait to go to warmer waters either. Food is everything when cruising. Makes you warm on a cold day and provinces social occasions on the good days. See Ruth’s comment. Say Hi to everyone. Thanks Ruth, you told him very well. Today is better as we sailed to Lang’s Marina and met us with our friends. Phil was driven by. Pat Doyle from Edgewater Yacht Club in Cleveland now lives here. It’s a small world. As he knows Cptn Dave Block.